Can one word change user experience on your website, for better or worse? YES. Think about the labels you experience on websites – and in the non-web world – every day. Most of them are just a word or two, and yet you rely on those words to give you confidence that you know what is going to happen if you take a particular action. Just try explaining this to my mom. 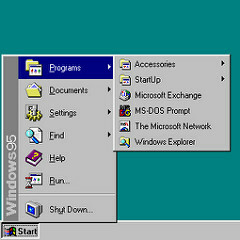 And speaking of “start,” did anyone else attempt to do tech support for less computer-literate coworkers or relatives in the days of Windows 95? “Okay, now to shut down your computer, click the Start button.” WHO COMES UP WITH THIS? THIS DOESN’T EVEN MAKE SENSE! “To stop the thing, click on the thing that starts the thing.” WHAT. And then, when Microsoft did away with the “Start” label and just offered a round buttony thing that does all the things, everyone still called it a “start button” and then they complained when it went away in later versions of Windows – but that’s another story. On a more local note, a few years ago our department did a little bit of lightweight user testing on some website labels we were considering. We were about to roll out new-and-improved subject pages that would include lists of databases, and we were trying to decide what to call a short list of databases that were the most generally useful within a subject. Start here? Best bets? Core databases? Research starters? Be like Google and call it “I’m feeling lucky”? And don’t get me started on “Useful Links.” The day I retire, I’m gonna go through and change all those labels to “Useless Clicky Things,” which is just about as meaningful. …Okay, I’m not. But I’m sure gonna think about it. More recently, as we were about to go live with a totally redesigned search box that was much more prominent on the Libraries’ home page, we had a long conversation about how to label it. We wanted something welcoming, something that would put the search box in context so you feel like you know how to use it. We thought about “What are you searching for in the library?” Well, there’s a saying that “only librarians like to search – everyone else wants to FIND.” (You know it’s true!) And we didn’t want to set a tone of “you’re going to be searching… and searching… and searching.” Eventually, and after some discussion of the relative merits of “what do you want to find” versus “what would you like to find,” we went with “What would you like to find at the library today?” And we also put “Search…” in the box for those who might be looking for that particular word out of habit. Which brings me to a fascinating article I just read. The very smart folks who run the GOV.UK website found that pages with buttons labeled “Start now” often ended up with users going around in circles rather than clicking the “start now” button. They observed this behavior in the lab when running tests, and then reviewed usage stats to find out whether the same thing happened “in the wild.” It did, so they set about testing different labeling options, using A/B testing to weigh several options and see which performed best. You can read about their testing methods, and the results they ended up with, in “A/Bsolutely fabulous testing” on the “Inside GOV.UK” blog. There are so many other examples of this kind of thing. Have you ever seen a confirmation dialog box pop up and been completely uncertain about which option you actually want? (“Do you really want to cancel?” with your choices being “YES” and “CANCEL” is a sad but true example.) Beth Aitman, who’s also in the UK – those wonderful UK word-nerds! – wrote a great article about how to write a confirmation dialog. This stuff – tiny little bits of text that make a big difference – is called “microcopy.” And it matters. It’s more than just labels and buttons; think about link text – what people click on to go somewhere else. Do they know where they’re going? Does the link make sense to them? What about somebody using a screen reader to access your page – do things make sense to them? Iain Broome (another Brit, it appears!) has a fantastic piece on “How to write good hyperlinks” which I highly, highly recommend. In fact, Broome’s article will help you think through the process of writing other things on the web, not just hyperlinks – that is, if you want to write things that are accessible and understandable to your users. I hope you do. I was so hoping for a rickroll with your last click here! Alas! I shall live to click here another day, because I’m never gonna give, never gonna give … Wait, what? !